Today I Will …. Acknowledge that these circumstances are hard and I don’t see a way out. 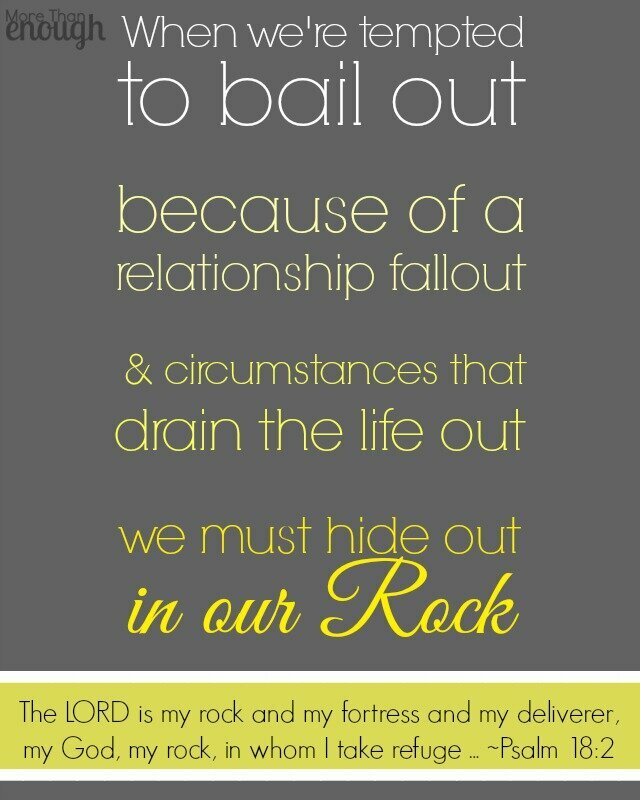 But instead of feeling stuck in between a rock and a hard place, I’ll lean on my Rock and look to Him for rest and peace. As I wait on the Lord, I’ll confess and repent of any sin that led me here. And I’ll focus more on God’s faithfulness than this season’s hardness. A friend of mine met up at a hotel with a man. A man not her husband. Her husband and she reconciled, then separated, then reconciled once more. Yet they remain with toes peeking over the edge of the breaking point. Hearts breaking. Spirits breaking. Tempers rising like a flood threatening to break the dam of their resolve to stay together. She told me it’s straight-up hard. Loving her husband feels hard. Not being annoyed with how loud he breathes or not allowing his finger tapping to grate her nerves. Not letting her heart and mind wander far from home. It’s difficult for her to imagine enjoying being married to her husband for the rest of this life. The terrain where David lived offered lots of high, lofty rocks to take refuge in. Some of these were caverns, some slits in tall rocks, some overhangs that offered shelter. Here’s the deal though: David had to flee to them to find safety from his enemy. —we must hide out in our Rock. That’s when we need to press into the Lord. Now, I know this can sound like a lofty idea. An over-used, somewhat frustrating, coffee mug slogan: “Just trust in the Lord. Lean on Him, not your own understanding.” How? How do we take refuge in God? 1. Rekindle your passion. Hard times can drag our attention and affection away from God. When we lose hope, we often lose heart. We quickly can neglect our relationship with Him, leaving us vulnerable to hard times becoming even harder. Proverbs 4:23 instructs us to “Guard your heart above all else, for it determines the course of your life.” What is one of the best ways to guard your heart? Saturate it with the Word. Start with reading just one verse. Or listening to just one sermon (resources suggested below). The smallest piece of flint can spark a flame. 2. Retrace your path. Look back … what brought you to this point? Many times we are the unwitting and unwilling recipient of someone else’s destructive decisions. But there are times we play a key- if not lead- role in our circumstances. Pray for clarity and discernment as to the actions that led you here. If needed, confess any sin and repent–to the Lord and to those you sinned against. Unconfessed sin has serious negative effects: “For when I kept silent, my bones wasted away through my groaning all day long” (Psalm 32:3). But, look at the freedom that comes through confession: “I acknowledged my sin to you, and I did not cover my iniquity; I said, ‘I will confess my transgressions to the Lord,’ and you forgave the iniquity of my sin. Selah” (vs. 5). I spoke with my friend not too long ago. “I just don’t think happiness is a reality,” she said. Sometimes, in the hard times, happiness will be fleeting. But when we lean on the Lord, security, rest, and protection are always present. As you wait between the Rock and your hard place, take time to read the Bible and pray, confess and repent, and remember His faithfulness.